If you are a military veteran that needs legal assistance in the area of Consumer Debt, you may contact one of the listed legal resources. The Disabled Veterans? 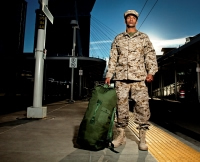 Exemption reduces the property tax liability for qualified veterans who, due to a service-connected injury or disease, have been rated 100% disabled or are being compensated at the 100% rate due to unemployability. Along with the disability requirements, a qualified veteran is one that has been honorably discharged from one of the military services and served during one of the time periods listed in California Constitution Article XIII, section 3(o).